Once it happened that Krishna, Balarama and Satyaki who were quite little boys at that time, scarce four or five years old, strayed into a thick jungle, all alone. Darkness fell, and there was no way of reaching Gokulam! Of course, as you must have guessed already, it was a stratagem of Krishna. Even at that age, he would do nothing without a deep purpose behind it and the purpose would invariably be teaching someone some good lesson. They decided to spend the night, just where they were. Krishna put fright into them with his descriptions of ghosts, ghouls, and demons roaming in search of human prey. He proposed that two of them sleep for three hours at a stretch while the other one keeps watch. It was Krishna’s duty to keep awake and be on the lookout from 7:00 to 10:00 p.m. Satyaki was to be vigilant from 10:00 p.m. to 1:00 a.m. Balarama was to start his part of the duty at 1:00 a.m. and keep on till 4:00 a.m. Satyaki sat up at ten and Balarama and Krishna laid themselves on beds of dried leaves and slept soundly. Meanwhile a demon did actually present himself before the little Satyaki. He fell upon the boy, who resisted heroically, dealing and receiving hammer strokes with fists with a good deal of clawing and biting in between. The demon had to retreat at last, leaving Satyaki badly mauled, but happy. The two brothers were sound asleep. They had not been disturbed in the least by noise of the encounter. Satyaki had met blow with blow, and dealt injury for injury. 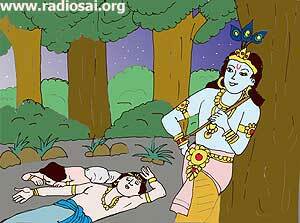 At 1:00, he awakened Balarama and stretched his body on the heap of leaves, as if nothing had happened. 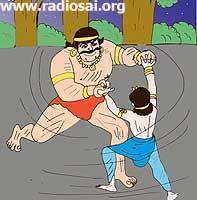 The demon invited Balarama, too, for combat and had to retreat humiliated, because Balarama too was as fierce as he, and his blows were even more terrible than Satyaki’s. Balarama too curled himself into the bed at 4:00 a.m. after awakening Krishna who was to keep watch in Brahmamuhurta, the auspicious hour when Gods are to be propitiated, that is, until dawn. The demon came roaring like a wounded tiger, and advanced furiously at the little Divine Boy. Krishna turned his sweet charming face at him, and rewarded him with a lovely smile. That smile disarmed the demon. The longer he came under its influence, the weaker became his vengeance and venom. At last, the demon became as docile as a lamb. When the other two awoke, they were surprised at the victory that Krishna had won by the weapon of Love. You cannot destroy anger by anger, cruelty by cruelty, hatred by hatred. Anger can be subdued only by forbearance. Cruelty can be overcome only by non-violence. Hatred yields only to charity and compassion. 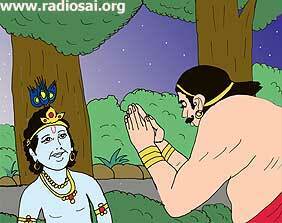 Dear Reader, how did you like this Chinna Katha? Do you have any thoughts you wish to share with us? If so please contact us at [email protected] and mention your name and country. Thank you for your time.